Hands-on with Paradox's new strategy game. When I sat down in front of Paradox's new grand strategy game I had one big question. What is Imperator exactly? Is it Crusader Kings in togas? Is it a Hellenic Europa Universalis? Is it, as the fans will no doubt ask, Vicky 3? The answer is none and all of these things. "You have the population mechanics that are similar to games like Stellaris or Victoria, the warfare and diplomacy which is similar to EU and the characters that are closer to Crusader Kings," explains Johan Andersson, the creative director on Imperator and a Paradox veteran of over 20 years. He knows what he's talking about, because he's worked on every single one of those games. In fact when I ask him which Paradox games he's worked on the list goes on for several minutes. "I didn't do super much on Stellaris, but everything else," he says. Imperator is the culmination of all this experience. The first thing I notice upon sitting down with the game is that the UI is dominated by a deeply Hellenic white marble and a generally bright and vibrant colour palette. "It's a very hopeful aesthetic," explains lead artist Joacim Carlberg. "Which contrasts to our previous games, at least CK, which does take place in the Dark Ages after all." There's also a terrific zoom option that automatically fades out from a detailed terrain map to a flat political one as you zoom out. Things are generally more accessible than previous Paradox games as well, with fewer options buried multiple menus deep. One of the nicest touches is the diplomacy screen where, instead of picking countries from a list, you simply open the diplomacy tab and then click on the country on the main map. It's still not easy to understand—the sheer amount of information the game is throwing out makes that difficult—but it is better. The second thing that I notice is the Senate. Yes, we're in the era of Republican Rome, not Imperial Rome. In fact, the game starts in the early days of the Republic and ends before the historic transition to Empire. "The Republican era is actually also when Rome is in its primary expansion phase," explains Henrik Lohmander, game designer. "When it comes to encompass the whole mediterranean and the Republic deals with the growing pains that come from that, and that's how they eventually end up being the Empire. Better to end there perhaps than do the Empire badly." Although players will be able to transition to Empire early, if they so wish. But I'm getting ahead of myself. Right now, Rome is a Republic, and that means the Senate votes on everything I do. The pool of senators is drawn from several factions, including military, merchants and religious types, all of which have different likes and dislikes (the merchants for example, don't want to go to war with anyone you are trading with). The numbers of senators from each faction change as they gain popularity, and if a faction is happy they provide a stat bonus to the Republic. In addition to this more abstract system, there are also named characters. Each belongs to a faction, and they do jobs like governors, advisors and generals. They also have traits and personalities (Brutus is crafty, of course) and some lovely memorable portraits. Here is where things start going wrong for me, because I pick the best general I can find and stick him in charge of my only army. His name is Marius Quintus, and he's a populist. Like any good Roman, I immediately declare war on my nearest neighbour, the Samnites. War is simpler in ancient times. There isn't really such a thing as a 'De jure Kingdom'—historic borders don't exist yet, so whatever you can hold you can keep. I still need to fabricate a claim to start wars (this is the era when casus belli first came to be used after all) but they're mostly a pretext, and it's perfectly okay to take more land than I initially demanded. "Every strategy game is about creating an empire," says Johan. "This is a period when that actually happened." This is a project Paradox is committing to not just now, but for years to come. The Samnites turn out to have a bunch of allies who back them up, so I call in my friends, and then our friends call in friends, and soon the entirety of Italy is on fire as 20 different tiny patchwork kingdoms start fighting over my land grab. The battles play out similarly to Crusader Kings 2, which is useful as it means I know what I'm doing. Quintus distinguishes himself with many victories, which is where the problems start. You see Quintus' army is now more loyal to him than they are to Rome. Since this is my entire army if Quintus decides that maybe he should be in charge instead of me there's really nothing I can do to stop him. It's characterful and appropriate to the era, but it's also an elegant solution to the age-old strategy game problem of not wanting players to stick all their units in one gigantic army. Unfortunately, I didn't know about it when I started and now there's an ominous icon saying 'countdown to civil war' in the top corner of the screen. Disaster is thankfully averted, although not because of me. Instead Quintus's popularity gets him elected to head of the Senate. This placates him and ends the civil war countdown. Thankfully, unlike CK2 I am not playing as a particular dynasty. I'll be in charge of Rome whoever is elected. In fact, if I wanted to change Rome to an Empire while still staying in charge then having a powerful populist leader like Quintus would be exactly what I wanted. "They're bad for the Republic, says Henrik, "But they might not be bad for you." During this period I start to dig down into the peacetime mechanics a bit more. In Imperator, each city is populated by citizens who produce research, freemen who produce manpower for the army, tribesmen who are useless and slaves (this is Rome after all) who produce raw materials. I can manually promote people between these different roles, but it takes a while. I'm assured there'll be a less micromanagement-heavy way to do it in the final game. There is also a relatively easy to grasp trade system. Each province produces goods, and each good gives a stat buff or opens up new building options (you need wood to build ships, for example). If a city has a surplus it can send that surplus elsewhere, including abroad if you have a trade agreement. But I only have a few hours with the game, and I want to see a civil war. Perhaps I shouldn't have thwarted Quintus after all. Thankfully content designer Peter Nicholson comes to my rescue. We start a new game as Macedonia, which unlike Rome is a Monarchy. This means I don't have to rely on Senate votes but instead track a stat called Legitimacy, which acts as a hard cap on the loyalty of characters and provinces (a third government type, Tribal, wasn't available to show). When Legitimacy is high a Monarch can do whatever they want, but Peter is about to show me what happens when it is low, using console commands to drop Cassander's legitimacy through the floor. Quickly the loyalty of Cassander's subjects plummets. If I'd only had one disloyal province or governor, Peter explains, they might just defect to another empire, or declare independence. But I don't have just one disloyal province, and instead Macedonia tears itself in two, with one half declaring itself under a pretender to my throne. This is not an easy fight, and unlike peaceful power transitions, if I lose it's a hard game over. This is Imperator's showpiece: its way to blow up a successful empire and keep the game interesting. I have run out of time, unfortunately. 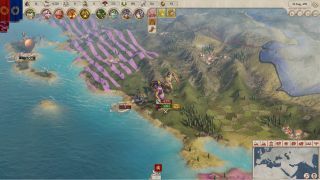 I won't get to see if Cassander survives (I don't rate his chances), but before I go I ask Johan one more question: Paradox is famous for supporting games for years after release with DLC and patches, so I ask him if he plans to do this with Imperator, expecting a non-committal answer. Instead I get a blunt "yes." In fact, he starts reeling off ideas for expansions that give depth to certain cultures: "a Greek one, Persian one, Indian one." He's very matter-of-fact that Rome is here to stay. This is a project Paradox is committing to not just now, but for years to come.